Preece produced. In the two races – Loudon, N.H., and Iowa – he snared a second and a victory. JGR wanted to see more so races at Kentucky and Homestead were sent his way. Again, Preece made the most of the opportunity, finishing fourth and fifth, respectively. In four Xfinity races last year he never finished outside the top five. 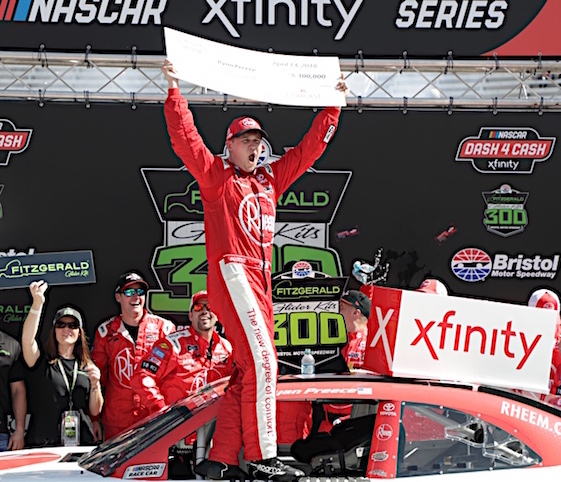 Nine more races for JGR this year, another victory, four top-five and six-top-10 finishes and now Preece owns a Monster Energy NASCAR Cup Series ride for 2019. Next year Preece replaces A.J. Allmendinger in JTG Daugherty Racing’s No. 47 Chevrolet. In an era when “buying rides” has become the norm, Preece’s “dream come true” story serves as an inspiration to local short-track racers. Preece noted it certainly wasn’t easy, but he knew if he fell down the “money, money, money” hole he would never make it. At age 22, Preece claimed the 2013 Whelen Modified Tour title, making him the youngest champion ever in that series and he owns 25-career Modified victories across the two NASCAR series that merged in 2017. Still, team co-owner Tad Geschickter doesn’t know if he would have considered Preece if it hadn’t been for his Xfinity Series victories in JGR’s Toyota. Geschickter also confirmed that Chris Buescher would return to the Harrisburg, N.C.-based operation and the team would switch to Hendrick Motorsports engines in 2019. ECR has been the team’s engine provider.